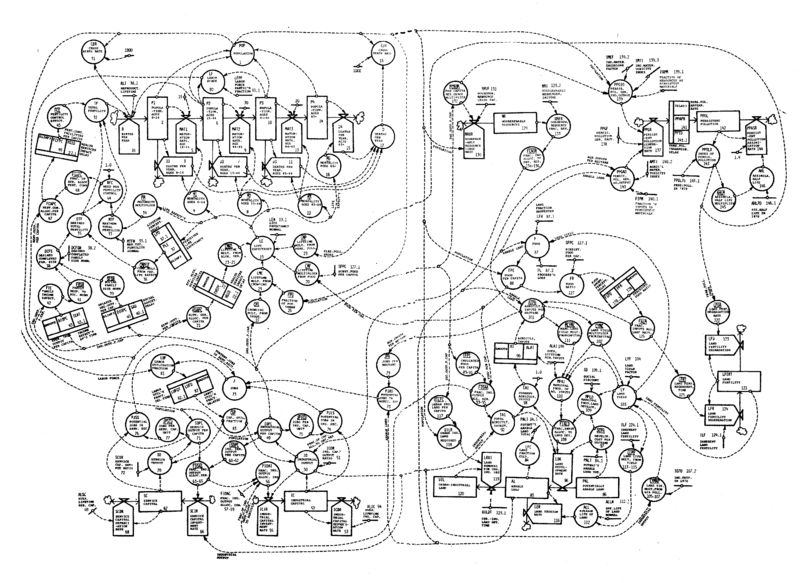 World3, Diagram of limits to growth in the world system, Commissioned by the Club of Rome, 1972. Below is the outline for a talk I will give in the Department of Geography, Environment and Society at the University of Minnesota as part of their ‘Coffee Hour Speaker Series’ (October 23 2015). This talk will center my ongoing research on the urban around what we could call the ‘regime of transparency’. Led by a coterie of institutions such as the IMF, the World Bank, the OECD, USAID, the International Chamber of Commerce, and others, the regime of transparency has set out to establish a unilateral global agenda to enforce the ethics of a single economic space—a meta-discursive imperative that increasingly molds all spheres of life to a common conduct. It comes as no surprise, then, that transparency has been at the forefront of contemporary spatial and architectural practices, in particular, those which have built themselves around a general rhetoric of ‘bettering’ a society plagued by multiple forms of crisis: From sustainable architecture, to ‘participatory’ strategies which ‘open’ the design process to the public, to ‘resilience urbanism’, transparency has subtly reorganized contemporary architectural practice through strategies of exposure. The aggregative effects of which are perceivable less in physical transformations they impose than in the way they cultivate a new ethics of urban space. If the world is increasingly perceived through a generalized experience of ‘crisis’, then transparency presents itself, in response, as the most viable meta-strategy for design to adopt in its interventions into the world. This talk will interrogate the dialogue between ‘transparency’ and the broad milieu of crisis in which its emergence is made possible. I will examine how, over the last four decades, the urban has become an arena in which what I call ‘technologies of transparency’ have coalesced into a generic form of urbanization which works by exposing life to its most intimate, private and seemingly banal occupations, re-presenting the urban as a totality of bodies in constant flux. If the urban more broadly can be understood as a mediator between space and law, then the employment of technologies of transparency today marks a fundamental shift in its spatio-political and spatio-juridical consistency: by conceiving the body as a measure of irrational behaviors, obscure desires, concealed habits and precarious patterns of life, such technologies illuminate the body as both a quantum of risk and a primary site of urbanization. Here, space and form are no longer the ends of design but rather serve as means: spatial design in the regime of transparency, we could say, is the art of modifying space to design behavior—a practice evermore inseparable from risk management. dear ROSSEXO, I am a professor of architecture at the university of Hong Kong and am very interested in your collection of articles and lectures. I would like to have your email and possibly invite you to give a talk in our school? Thank you for your kind words and interest! My email is rossexo@gmail.com. I look forward to speaking with you!